If you are interested in how SEO evolves, you need to learn about the optimization for RankBrain. Because Google communicated that RankBrain is their third most valuable ranking indicator. This short guide will summarize the key aspects you need to know about Google’s RankBrain algorithm. Part 1: What is Google RankBrain? 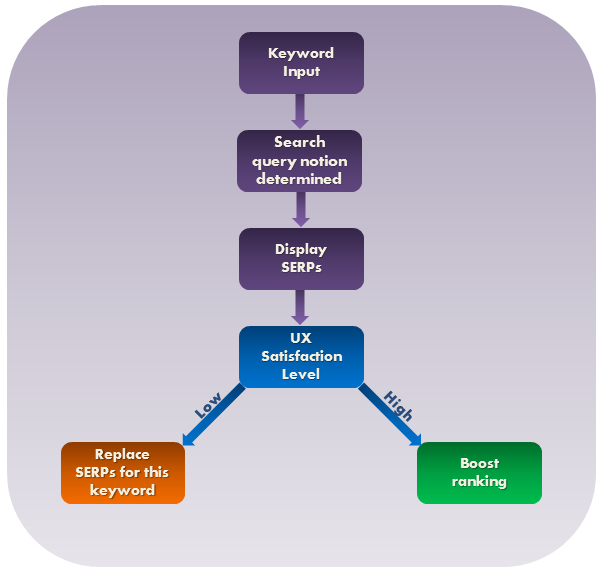 Part 2: How is SEO Keyword Research Influenced? Part 3: How to Optimize for RankBrain? RankBrain is an AI algorithm developed by Google that helps sort, process and understand search queries (keywords). Think of it this way – every change to Google’s algorithm would’ve been done manually before RankBrain, and it actually achieved a 10% more accurate predicting of the #1 Google result, compared to Google’s Engineers. It uses UX (user experience) signals to interpret search queries and rank relevant content accordingly. Part 2: How is Keyword Research Influenced? To understand how SEO Keyword Research is influenced by RankBrain, we need to analyze points A & B from Part 1. Remember the times when you were searching for one thing, and Google came up with an entirely different result? RankBrain now understand what you are searching for and brings up only the most relevant results. If a few years back you were inputting the search “what is the capital of Spain”, Google would be showing pages of websites containing “capital” and “Spain”. Currently, RankBrain figures out that your search query is actually about you wanting to find out what is the name of Spain’s capital. It compares your search with similar ones such as “what is the capital of Germany” and prioritizes the pages with high user satisfaction levels. This is achieved by using the “Word2Vec” technology (turning keywords into concept by associating “Madrid” with “Spain” as capital and country) & UX signals. RankBrain examines how people react to certain search results and tweaks the ranking accordingly. If many people liked one particular page from the results for a specific keyword, it will rank it higher next time someone types the same keyword. Pogo-sticking – back and forth action of visiting a website from Google search result then clicking back to the Google search results page to choose another website. This is done constantly, thus ensuring that users get the most relevant page for their keyword input. Simply put, focus the optimization on Medium Tail Keywords. A consequence of what was explained in Part 2 is that optimizing for Long Tail Keywords has become redundant. “best photo editing software” and “best software for photo editing” will bring up pretty much the same results due to RankBrain’s understanding of your search query. What you want to do is keep your optimization targeted on Medium Tail Keywords, because when your page is optimized this way you will rank for that specific term, but also for hundreds or thousands of similar keywords. Choose a single keyword for your page optimization and let RankBrain do its job to rank you for many different but related keywords. We actually noticed this algorithm a few years ago and used this in our SEO strategies with amazing success but we didn’t knew it has a name. I first find out about this RankBrain notion on https://backlinko.com/google-rankbrain-seo. It’s up to you to make use of this knowledge and to constantly adapt your SEO by always using the latest SEO techniques and best SEO practices for maximum results.